You may have heard your occupational therapist use the term “sensory diet.” It’s how we describe those activities employed to help assist children with sensory processing disorder. The technical term for these activities is “sensory integration intervention.” Many children with autism spectrum disorder are also diagnosed with sensory processing disorder, but not everyone with SPD has ASD (or visa versa). Here in Southwest Florida, the beach is a main draw for tourists and residents alike. Our occupational therapists know it’s a great place to help your child feed their sensory diet.. Exploring sensory input – from the gritty sand to the bubbly waves – can provide just the right amount of stimulation and calming for your child, and it can be adapted depending on your child’s needs. A sensory diet involves integrating an appropriate level of sensory input based on the individual child’s needs. So for example, this could include introducing variety of different foods for those with extreme aversions to anything outside of their self-determined (and often rigid) taste and texture guidelines. We do this through “play,” which might involve touching it, rolling it, squishing it, shaking it, looking/ talking about it and then finally kissing it and putting it to their lips and mouth. This could take weeks or months for a single food, but the goal is ultimately to promote a healthier diet. But just as your child cannot survive on chicken nuggets alone, a healthy sensory diet will help incorporate different kinds of activities to feed their need for a variety of sensory input. In general, a child with sensory processing disorder who is not getting the appropriate level and type of stimulus is going to act out in other ways, whether it’s “stimming” or low attention span or extreme difficulty with transitions. 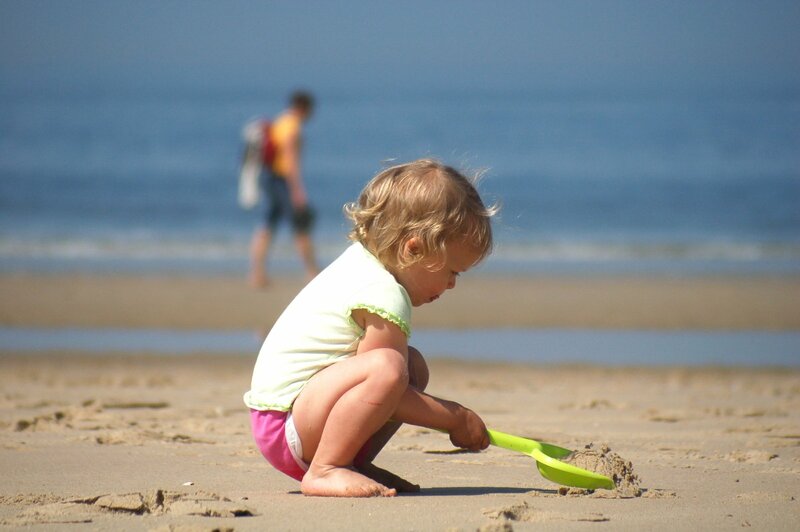 The beach can be a perfect place for some children with sensory processing disorder. Parents and caregivers can help tailor the experience to be as calm or as active as the child needs. If your child often becomes quickly overstimulated, you can often plan for this firstly by choosing a beach you know will be a bit more secluded (i.e., Sanibel/ Captiva versus Fort Myers Beach). You can also prepare by having some snacks on hand you know will be calming for them. Consider also bringing a lightweight jacket or long-sleeved shirt and a broad-brim hat, sunglasses or umbrella to keep the blazing sun out. Consider going first thing in the morning or right before sunset. Keep flip-flops handy if the sensation of the sand gets too be too much, and have baby powder in your beach bag to help quickly remove sand from the skin. Extra dry towels are also a good idea. If your child is extremely averse to the Gulf waves, consider bringing a baby pool so he or she can enjoy the water without being overwhelmed by the water’s movement. The hope is that not only will your child – and the whole family – enjoy a nice beach day, but that your child will have “fed” their sensory diet, leaving with greater calm and focus. If you have questions about other sensory diet ideas for the beach and other recreational activities, our Fort Myers occupational therapists can help.